Poverty Point consists of 80 acres approximately 10 minutes northeast of Rushville, Illinois. It borders the Layne Farm on its western side, as shown in the aerial photo below. 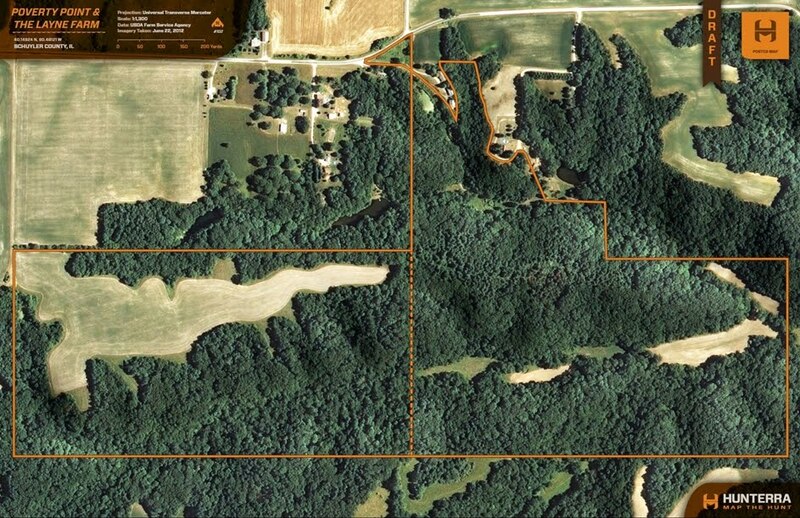 The property is made up of 23 agricultural acres, 7 acres of CRP (CP-33, Quail Buffer Program) and 50 acres of mature hardwood timber. It is a beautiful tract with a variety of terrain changes. A seasonal creek with crystal clear water crosses the entire property from west to east before entering the Layne Farm. Poverty Point was featured in The Land Report in an article written by Teraprom's founder on August 16, 2007. Click here to read the Poverty Point Story.